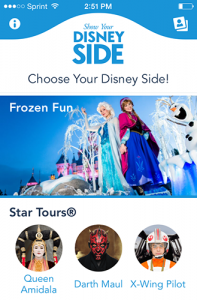 Bring your Disney Side to life with the Show Your Disney Side app. Start with a selfie and let the app do the rest! Choose from iconic attractions and experiences like Frozen, Star Tours®*, Pirates of the Caribbean®, and Villains of Disney Parks. You can unlock special Haunted Mansion® characters by visiting either Disneyland® Resort or Walt Disney World® Resort, or by sharing three Show Your Disney Side app creations. Disney Publishing Worldwide today re-defines the storytelling experience with the release of “Star Wars Scene Maker,” a new line of creativity apps that gives kids and Star Wars fans of all ages the tools to create, control, customize, capture and share their own 3D animated Star Wars scenes. Utilizing simple, intuitive commands, the apps give fans an unrivaled user-generated storytelling experience that allows them to re-imagine and re-create iconic scenes from the Saga. GLENDALE, Calif., May 1, 2014 – Drawing from the success of its interactive storytelling products, Disney Publishing Worldwide today announced the launch of “Star Wars Journeys,” a new episodic series of apps featuring the stories, heroes and villains from a galaxy far, far away. With immersive story content and fast-paced activities and game play, “Star Wars Journeys” apps will introduce the epic Star Wars universe to the next generation of fans like never before. More than half a dozen apps are slated for release for the Kids and Entertainment categories of the App Store; “Star Wars Journeys: The Phantom Menace” is available now and additional apps in the portfolio will roll out in sequential order leading up to the release of Star Wars Episode VII.